Buying local has never been a hotter topic or easier to do. 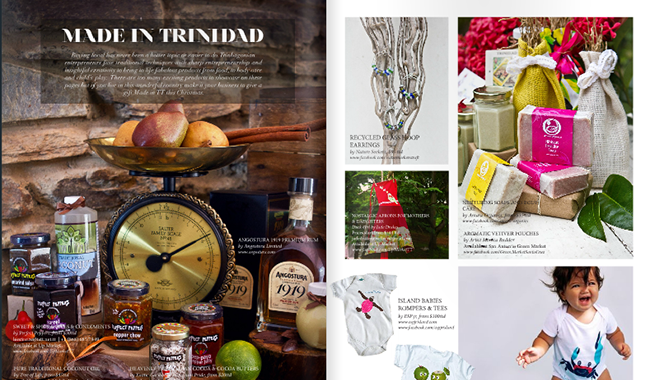 Trinbagonian entrepeneurs fuse traditional techniques with sharp entrepeneurship and insightful creativity to bring to life fabulous products from food, to body care and child’s play. There are too many exciting products to showcase on these pages but if you live in this wonderful country make it you business to give a gift Made in TT this Christmas. From Ethical Gifts for Tots to Ways to Style your Man; The editorial team picks Gifts to Give (and Get); What our Inspirational Women define Christmas as, there is something for everyone with the Ethical Christmas Guide. Check it out and share with your loved ones.